In a previous article on this blog we already outlined the historical roots of the socio-economic marginalisation of the Mizrahi (lit. “Eastern” Jews, stemming from Middle East, North Africa and the Caucasus) communities by the dominant Ashkenazi (usually understood as European Jews) elite. The subordination of the Mizrahim also included the forced erasure of those communities' cultural origins and the adoption of a Western Israeli culture as constituted by the Ashkenazi ruling class. Like many other cultural practices, popular music also serves as a central means of demarcating national borders and during the first decades of the new Israeli state the music by Mizrahi artists was considered culturally inferior and “too Arab” and was therefore marginalised. Yet like in many other settings where subaltern groups do not feel represented by the sanctified musical genre, Mizrahi musicians in Israel also created new hybrid musical styles, which are now commonly subsumed under the term Musika Mizrahit. This article attempts to outline the rise of this genre from the margins to one of the most popular music styles in Israel today. 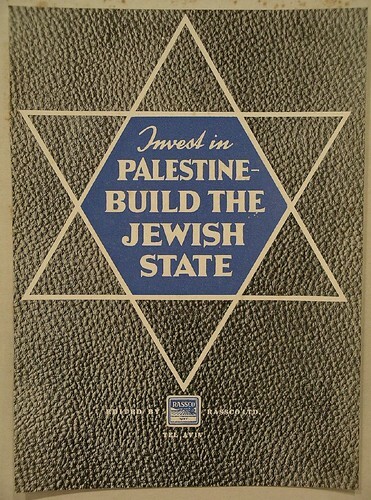 Between 1948 and 1953, the Jewish population in Israel more than doubled from 650,000 to 1,500,000, with the overwhelming majority of those new immigrants coming from Arabic speaking, or Muslim majority countries. The absorption of those large numbers of people by the new state proved to be highly problematic and most of the new immigrants were placed in tent cities or development towns at the peripheries of Israel. Through the new proximity as well as the common experience of being marginalised by the Western Ashkenazi establishment, these places became soon the settings for intensified musical interactions between North African and Middle Eastern Jewish musicians, who created new styles that were rooted in both Arab and Jewish cultures. Those musicians, some of who used to be well-known in their countries of origin, were eager to contribute to the national task of formulating a new Israeli musical style, yet their lack of Western training and notation skills were often used as a justification for their exclusion. At the same time, within their own neighbourhoods, new Mizrahi music styles kept flourishing and became more and more popular. The new styles typically featured Western elements, such as electric bass, guitar and synthesizers which were arranged around a Middle Eastern vocal centre, an ornamented vibrato invoking the characteristic Middle Eastern quarter tonality, which lies between and is absent from Western scales. 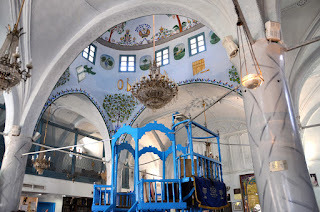 Those same scales, known as “maqamat”, are also used in Jewish Middle Eastern liturgy, and since many Mizrahi musicians came from traditional families, they were used to listen to and chant those scales since their childhood. In addition, they were accustomed to listening to Arabic music in their homes through their parents and grandparents. The lyrics were sung in a combination of literary and biblical Hebrew, modern Hebrew slang and a number of other languages, including Arabic, Persian, Turkish, Greek and Kurdish languages. According to Amy Horowitz this new style clearly revealed the "ingathering and subsequent blending of Diaspora Jewish communities as a patchwork or overlapping neighbourhoods rather than a homogeneous national whole” as planned by the early Zionist leadership. 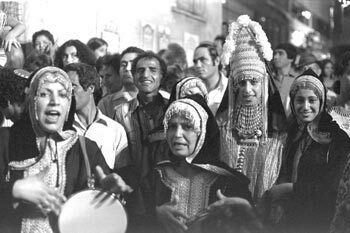 Throughout the 1950s and 1960s this music was mainly played live during Mizrahi neighbourhood celebrations, such as weddings, births, bar mitzvahs, and religious holidays. During the 1970s however this should change. On the one hand, Mizrahi neighbourhood youth started to become more politically conscious and, inspired by the African American civil rights movement in the US, also more active. Radical political movements, such as the Israeli Black Panthers, mobilised to challenge the hegemonic state policies by the Ashkenazi ruling class, and instilled a new pride in the Mizrahi communities, which in turn also influenced Mizrahi artists and eventually led to a Mizrahi cultural renaissance, which would redefine the boundaries of Israeli society. Equally important to the rise of Mizrahi music was the invention of the cassette. In Israel like in many other places the cassette's affordability and plasticity facilitated “commercial and musical growth, empowering community-based music and altering local soundscapes forever". Mizrahi musicians were thus enabled to sidestep the state-controlled media and other mainstream channels that had rejected their music and started selling hundreds of thousands of cassettes in their neighbourhoods and among the vegetable and household appliance stalls in Tel Aviv's central bus station marketplace. Ashkenazi radio editors, record companies and listeners however still refused to pay attention to this “culturally inferior” music. In the 1980s Zohar Arhov, a musician of Yemeni descent finally managed to infiltrate national airwaves. Through the singer's immediate success Mizrahi music was for the first time aired on mainstream Israeli radio stations, however only in specific programmes that would usually be broadcast late at night. "If the Syrian people requested, do you think Israeli singers would come to perform for us personally? I am trying to learn Hebrew so I can understand the words to all your beautiful songs. I ask God that an agreement can be reached between our two countries so that we will be able to see you." In the following years even established Ashkenazi singers started quoting the Mizrahi style and thereby added to its acceptability and popularity. By now most Israeli mainstream nightclubs play Mizrahi pop and the above mentioned Zohar Argov was postmortem declared an Israeli cultural icon. Amy Horowitz asserts that music is a “kind of territory where incongruent and contesting cultural forms can meet. This convergence could produce a healthy coexistence whereby diverse forms flourish in mutual respect and creative interaction." Mizrahi music managed to incorporate elements of the Middle East into the otherwise so Western Israeli culture and succeeded in blurring the borders between Arab and Jewish Israeli culture. However, the fact that Jews from Middle Eastern origin are referred to as “Mizrahim”, and not as Jewish Arabs, already hints at the dichotomy and the inferred antagonistic relationship between the two groups. Until today Jewish and Arab cannot be thought together in Israeli national culture.